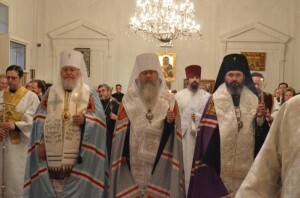 His Beatitude, Metropolitan Tikhon, Primate of the Orthodox Church in America, presided at a Panikhida commemorating all the Royal Members of the Romanov Dynasty at the Synodal Cathedral of Our Lady of the Sign, New York, NY on Tuesday, June 18, 2013. Concelebrating with Metropolitan Tikhon were His Eminence, Metropolitan Hilarion, First Hierarch of the Russian Orthodox Church Outside of Russia, and His Eminence, Archbishop Justinian of Naro-Fominsk, Administrator of the Patriarchal Parishes in the USA. Following the Panikhida, a reception to mark the 400th Anniversary of the House of Romanov was held.